The world is full of stressful jobs: brain surgeons, soldiers, firefighters... White House chiefs of staff. But you know who has the toughest gig of 'em all? Santa. The dude literally crisscrosses the globe in a single night and has to deal with bratty kids and anxious parents all the time. Of anyone, he deserves a stiff cocktail and some peace and quiet after logging the long hours. 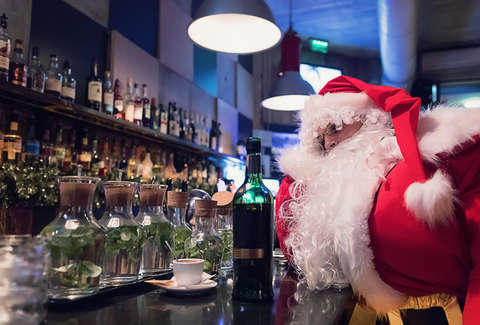 That's precisely why a restaurant in London just opened a private members-only club that caters exclusively to a very specific clientele: professional Santa Clauses during the holiday season. M. Victoria, a buzzy restaurant in central London, is making the holidays a little more tolerable for the seasonal Saint Nicks looking for a respite at the end of the day by opening a special members-only club where they can chill and drink for free until Christmas Eve. The restaurant has teamed up with the Port brand Cockburn's and will be handing out free glasses of Cockburn's Special Reserve for the beleaguered, big-bellied bearded dudes to help them destress. Although it may conjure up the booze-fueled depravity a la Bad Santa, it's actually quite a nice gesture, and a welcome one at that. According to Cockburn's, which surveyed 100 working Santas, 92% of them "succumb to workplace stress during the yuletide season," according to The Spirits Business. They also asked them what the most stressful parts of the job are, with the uniform taking the top spot, followed by things like pushy parents, being constantly jolly, and maintaining "Santa weight." Though the whole endeavor is a not-so-secret marketing stunt, it's an idea that is still dear to M. Victoria founder Martin Williams' heart, since he is a former working Santa himself. “Sometimes all you want after a long day in the grotto is to be able to unwind with some good company and a glass of your favorite tipple, which we’ll happily provide," he said in an in interview with The Spirits Business. It's not clear exactly how they'll be validating entry to avoid any rogue Santacon situations, seeing as there's no special Santa Claus ID card (or is there? ), or whether patrons must arrive in full regalia, but at least there's good reason for London area Kris Kringles to be feeling a little jollier this year.